KFC Potato Salad Recipe? 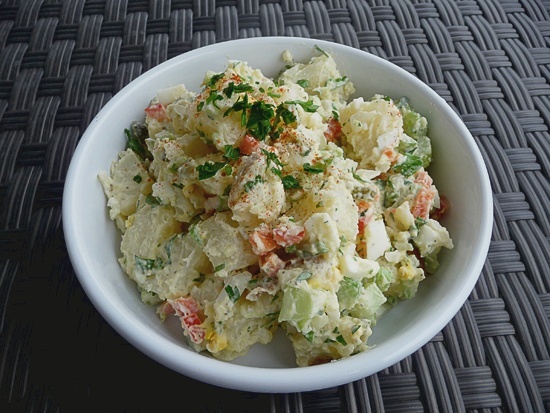 This simple delicious potato salad has plenty of flavor with pickle relish, mayonnaise, and chunks of cherry pepper, celery, shredded carrot, and firm fingerling potatoes. Scrub potatoes, peel, trim bruises and other imperfections and cut into 1-inch pieces. Put potatoes in a large saucepan and cover with water. Add 1/2 teaspoon of salt, bring to a boil; reduce heat to medium-low, cover, and cook for 12 to 15 minutes, or until potatoes are fork-tender. When the potatoes are done, drain and let cool completely. Place potatoes in a large bowl along with the dressing by mixing the mayonnaise, pickle relish, sugar, white onion, mustard, vinegar, celery, cherry pepper, carrot, parsley, pepper, and salt. For best flavor, refrigerate Potato Salad overnight.